The mast of a sailing vessel is a tall spar, or arrangement of spars, erected more or less vertically on the centre-line of a ship or boat. Its purposes include carrying sail, spars, and derricks, and giving necessary height to a navigation light, look-out position, signal yard, control position, radio aerial or signal lamp. Large ships have several masts, with the size and configuration depending on the style of ship. Nearly all sailing masts are guyed. Until the mid-19th century all vessels' masts were made of wood formed from a single or several pieces of timber which typically consisted of the trunk of a conifer tree. From the 16th century, vessels were often built of a size requiring masts taller and thicker than could be made from single tree trunks. On these larger vessels, to achieve the required height, the masts were built from up to four sections (also called masts), known in order of rising height above the decks as the lower, top, topgallant and royal masts. Giving the lower sections sufficient thickness necessitated building them up from separate pieces of wood. Such a section was known as a made mast, as opposed to sections formed from single pieces of timber, which were known as pole masts. Those who specialised in making masts were known as mastmakers. Sprit topmast: a small mast set on the end of the bowsprit (discontinued after the early 18th century); not usually counted as a mast, however, when identifying a ship as "two masted" or "three masted"
Mizzen-mast: the aft-most mast. Typically shorter than the fore-mast. Bonaventure mizzen: the fourth mast on larger sixteenth century galleons, typically lateen-rigged and shorter than the main mizzen. Jigger-mast: typically, where it is the shortest, the aftmost mast on vessels with more than three masts. This photo of the full-rigged ship Balclutha, shows the fore-mast, main-mast and mizzen-mast, as well as all the ship's standing and running rigging. The Balclutha is berthed in San Francisco, and is open to the public. Most types of vessels with two masts are supposed to have a main-mast and a smaller mizzen-mast, although both brigs and two-masted schooners carry a fore-mast and a main-mast instead. On a two-masted vessel with the main-mast forward and a much smaller second mast, such as a ketch, or particularly a yawl, the terms mizzen and jigger are synonymous. Although two-masted schooners may be provided with masts of identical size, the aftmost is still referred to as the main-mast, and normally has the larger course. Schooners have been built with up to seven masts in all, with several six-masted examples. On square-rigged vessels, each mast carries several horizontal yards from which the individual sails are rigged. In the West, the concept of a ship carrying more than one mast, to give it more speed under sail and to improve its sailing qualities, evolved in northern Mediterranean waters: The earliest foremast has been identified on an Etruscan pyxis from Caere, Italy, dating to the mid-7th century BC: a warship with a furled mainsail is engaging an enemy vessel, deploying a foresail. A two-masted merchant vessel with a sizable foresail rigged on a slightly inclined foremast is depicted in an Etruscan tomb painting from 475–450 BC. An artemon (Greek for foresail) almost the same size as the galley's mainsail can be found on a Corinthian krater as early as the late 6th century BC; apart from that Greek longships are uniformly shown without it until the 4th century BC. The foremast became fairly common on Roman galleys, where, inclined at an angle of 45°, it was more akin to a bowsprit, and the foresail set on it, reduced in size, seems to be used rather as an aid to steering than for propulsion. While most of the ancient evidence is iconographic, the existence of foremasts can also be deduced archaeologically from slots in foremast-feets located too close to the prow for a mainsail. 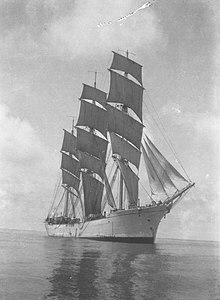 Artemon, along with mainsail and topsail, developed into the standard rig of seagoing vessels in imperial times, complemented by a mizzen on the largest freighters. The earliest recorded three-masters were the giant Syracusia, a prestige object commissioned by king Hiero II of Syracuse and devised by the polymath Archimedes around 240 BC, and other Syracusan merchant ships of the time. The imperial grain freighters travelling the routes between Alexandria and Rome also included three-masted vessels. 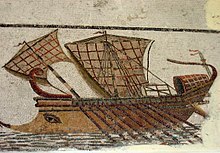 A mosaic in Ostia (c. 200 AD) depicts a freighter with a three-masted rig entering Rome's harbour. Special craft could carry many more masts: Theophrastus (Hist. Plant. 5.8.2) records how the Romans imported Corsican timber by way of a huge raft propelled by as many as fifty masts and sails. Throughout antiquity, both foresail and mizzen remained secondary in terms of canvas size, although large enough to require full running rigging. In late antiquity, the foremast lost most of its tilt, standing nearly upright on some ships. By the onset of the Early Middle Ages, rigging had undergone a fundamental transformation in Mediterranean navigation: the lateen which had long evolved on smaller Greco-Roman craft replaced the square rig, the chief sail type of the ancients, that practically disappeared from the record until the 14th century (while it remained dominant in northern Europe). The dromon, the lateen-rigged and oared bireme of the Byzantine navy, almost certainly had two masts, a larger foremast and one midships. Their length has been estimated at about 12 m and 8 m respectively, somewhat smaller than the Sicilian war galleys of the time. Multiple-masted sailing ships were reintroduced into the Mediterranean Sea by the Late Middle Ages. Large vessels were coming more and more into use and the need for additional masts to control these ships adequately grew with the increase in tonnage. Unlike in antiquity, the mizzen-mast was adopted on medieval two-masters earlier than the foremast, a process which can be traced back by pictorial evidence from Venice and Barcelona to the mid-14th century. To balance out the sail plan the next obvious step was to add a mast fore of the main-mast, which first appears in a Catalan ink drawing from 1409. 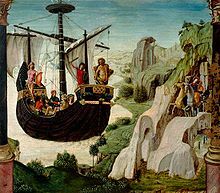 With the three-masted ship established, propelled by square rig and lateen, and guided by the pintle-and-gudgeon rudder, all advanced ship design technology necessary for the great transoceanic voyages was in place by the beginning of the 15th century. The first hollow mast was fitted on the American sloop Maria in 1845, 92 feet long and built of staves bound with iron hoops like a barrel. Other hollow masts were made from two tapered timbers hollowed and glued together. Nearly a century later, the simple box form of mast[clarification needed] was arrived at. Although sailing ships were superseded by engine-powered ships in the 19th century, recreational sailing ships and yachts continue to be designed and constructed. In the 1930s aluminium masts were introduced on large J-class yachts. An aluminium mast has considerable advantages over a wooden one: it is lighter and slimmer than a wooden one of the same strength, is impervious to rot, and can be produced as a single extruded length. During the 1960s wood was eclipsed by aluminium. Aluminium alloys, generally 6000 series, are commonly utilised. Recently some sailing yachts (particularly home-built yachts) have begun to use steel masts. Whilst somewhat heavier than aluminium, steel has its own set of advantages. It is significantly cheaper, and a steel mast of an equivalent strength can be smaller in diameter than an aluminium mast, allowing less turbulence and a better airflow onto the sail. From the mid-1990s racing yachts introduced the use of carbon fibre and other composite materials to construct masts with even better strength-to-weight ratios. Carbon fibre masts could also be constructed with more precisely engineered aerodynamic profiles. Modern masts form the leading edge of a sail's airfoil and tend to have a teardrop-shaped cross-section. 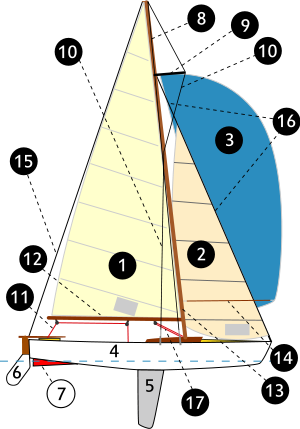 On smaller racing yachts and catamarans, the mast rotates to the optimum angle for the sail's airfoil. If the mast has a long, thin cross-section and makes up a significant area of the airfoil, it is called a wing-mast; boats using these have a smaller sail area to compensate for the larger mast area. There are many manufacturers of modern masts for sailing yachts of all sizes, a few notable companies are Hall Spars, Offshore Spars, and Southern Spars. After the end of the age of sail, warships retained masts, initially as observation posts and to observe fall of shot, also holding fire control equipment such as rangefinders, and later as a mounting point for radar and telecommunication antennas, which need to be mounted high up to increase range. Simple pole, lattice, and tripod masts have been used—also, on some past Japanese warships, complex pagoda masts. ^ Layton, Cyril Walter Thomas, Peter Clissold, and A. G. W. Miller. Dictionary of nautical words and terms. Brown, Son & Ferguson, 1973. ^ Harland, John. Seamanship in the Age of Sail, pp. 22-5, Naval Institute Press, Annapolis, Maryland, 1992. ISBN 0-87021-955-3. ^ a b Keegan, John (1989). The Price of Admiralty. New York: Viking. pp. 278&281. ISBN 0-670-81416-4. ^ Harland, John. Seamanship in the Age of Sail, pp. 15, 19-22, 36-37, Naval Institute Press, Annapolis, Maryland, 1992. ISBN 0-87021-955-3. ^ Harland, John. Seamanship in the Age of Sail, pp. 15, 19, 36-37, Naval Institute Press, Annapolis, Maryland, 1992. ISBN 0-87021-955-3. ^ Parker, Dana T. Square Riggers in the United States and Canada, pp. 55, Transportation Trails, Polo, Illinois, 1994. ISBN 0-933449-19-4. ^ Torrey, Owen C., Jr. (1965). Sails (Seamen's Bank for Savings ed.). New York: Palmer & Oliver. pp. 38&39. ^ Harland, John. Seamanship in the Age of Sail, pp. 20-2, Naval Institute Press, Annapolis, Maryland, 1992. ISBN 0-87021-955-3. ^ "Tabernacle". Sea Talk Nautical Dictionary. ^ a b Philips-Birt, Douglas (1954). Rigs and Rigging of Yachts. W&J Mackay & Co. Ltd. pp. 87–88. ^ Beck, R., et al. "SAILING YACHT DESIGN." (2009). ^ Schinas, Jill. "Build your own steel masts". Yacht Mollymawk. Retrieved 1 August 2013. ^ Dix, Dudley. "Dudley Dix Yacht Design FAQ - Steel Boats". Retrieved 1 August 2013. Wikisource has the text of the 1911 Encyclopædia Britannica article Mast. This page was last edited on 5 March 2019, at 18:21 (UTC).